The Razor Dirt Rocket Electric Motocross Bike is a heavy-duty toy that has kids from all over the country putting it on their Christmas list. It’s the ideal gift for any child that is enthusiastic about motorcycles and engineering The MX500 has a powerful 500W electric motor, can carry up to 175lbs, has a 60 day warranty, and can carry its rider at a speed of about 15mph, over various terrains. It can be hard to satisfy the needs of a budding or daredevil motorcyclist. You don’t want to restrain them, but you don’t want to encourage dangerous daredevil acts at such a young age, either. Buying them a real motorcycle is definitely out of the question. However, since they have been begging for one for over 3 or more years, there are other alternatives to satisfy their need for speed with the variable speed throttle. Buying the MX500 may not just be beneficial for the kids, but for the parents, too. You will gain a sense of trust within your kids when you will be giving the benefit of the doubt, buying this pricey product. It’s definitely one from the top shelf, and will need to be taken care of. You will be able to help your child take responsibility of their belongings, if you haven’t managed to do so before. Regardless, the MX500 is a wonderful toy that will be both fun and educational. It will giver your kids the thrill of owning a real authentic dirt bike, and you will be able to finally get them out of the house! The MX500 is an electric dirt bike that has been specifically modelled after real, professional, motocross bikes. This means that the MX500 can not only do all the stunts, but looks like it can do them, too. The appeal of the Razor MX500 Dirt Rocket Electric Motocross bike is definitely one of the most important things to look at when buying the toy for your child. Whatever age they are at, they will want something that looks ‘cool’. Something that they can show to their friends, and get a suitable reaction of awe. Razor knows how much kids love showing off their prized possessions, and that’s why they designed the Razor MX500 Dirt Rocket Electric Motocross bike to look as sporty and as attractive as possible. The combination of blacks, yellows, reds and whites probably doesn’t put the parents’ worries at rest. This definitely looks like a menacing electric dirt bike, but all in all it’s a safely built, sturdy toy. The color scheme already makes you think of speed and danger, and it’s just enough to get the adrenaline going, but it’s 100% safe. There is no doubt that your kids will want to hop onto this well-manufactured motorcycle within minutes of receiving it. Every motorized/electrical toy has a battery life and it’s own charging time. This feature may cause a lot of moaning, groaning and disappointment, but it’s vital to take it into consideration when purchasing the product. You will have to spend the majority of the Razor MX500 Dirt Rocket Electric Motocross bike’s life charging it, since it needs to have the energy to run. Generally, for the MX500, about 12 hours is enough. This charge boost should give the electric bike enough energy to work for an hour or more, allowing for lots of fun and continuous use. Since this is an electrical toy, it’s important to mention that you may notice a change in your electrical bills when you purchase it. Charging anything for 12 hrs is no small feat. 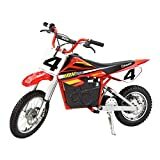 If you have an enthusiastic child or children that want to constantly use and take turns with the Razor MX500 Dirt Rocket Electric Motocross bike, then this toy may become an expensive investment.This is, after all, a toy with a 500W electric motor, and a 36V rechargeable battery. Luckily, many electricity plans already have good deals for constantly running appliances like lights and television. This means that a new appliance shouldn’t make that much of a change to the stability of your bills, but it’s still an important factor to keep in mind. You can always set up limits for using the bike, too. For example, only allow it for good behavior, or after school in intervals of 20 minutes, or just on weekends. The dimensions of the Razor MX500 Dirt Rocket Electric Motocross bike have been a big topic of discussion. The bike itself has dimensions of 56 inch x 24.5 inch x 36 inch when assembled. This, from the get-go, may seem rather small for any grown 14+ years old, and that assumption is true. 95% of the customers agree that this authentic dirt bike is meant for children between 8 and12 years, and not 14+ year olds. Even for bigger 12 year olds it may already seem a bit on the small side. That’s why we recommend either following the advice of dismissing the age recommendation, or going to a local supermarket and checking out the MX500 Dirt Rocket for yourself. To conclude, we recommend this bike for 8-12 year old dirt biking fanatics. Even younger kids can give it a go if they are mature enough to follow the instructions and safety recommendations.The core of the matter is, that is bike is by no means a bike for 14 year old, and even less so for anyone older. If you are looking for a motocross bike for a 14 year old, then we can recommend newer Razor bikes, like the Razor RSF650 and Razor MX650. The bike itself has double suspension, and adjustable handlebars. It has large 16 inch wheels at the front, and 14 inch wheels at the back. These large wheels enable the bike to go as fast as it can, and help to propel the MX500 through various terrains. Both of the wheels are pneumatic, which means that they are filled with pressurized air on the inside. These kinds of wheels are ideal for speeding through both gravel roads and grass fields, and will only wear out after rigorous use. The bike does require some assembly, but it’s very simple. It’s a great exercise to help your child put it together, since it will allow them to see how difficult it can be get something to work. It will also give them a sense of achievement when they finish, and a pat on the back from mom and dad. Another advantage to this practice is that they may even take extra good care of it, since they saw how much effort it took to put it together. The bike also comes with a manual, and has a sturdy steel construction that should support anyone up to 175 pounds. It’s important to talk your child through the manual before putting them onto the motor bike. This will ensure that they know how to use the bike for dirt biking moto without having to figure it out. The latter usually results in injuries and accidents, and that’s why it’s also important to take precautions. Make sure to provide a helmet and knee and elbow pads for your child, too. All in all, the Razor Dirt Rocket is easy to put together, and is easy to use. Most parents report that their kids take to the new controls within 15 minutes. The bike also has a ‘closed system’, which means that the kids won’t be able to reach any of the inside mechanics of the authentic dirt bike, harming themselves accidentally. Even though Razor states that this bike should be used by 14 year olds and above, most people will agree that it’s ideal for kids between 8-12 year olds who are into dirt biking. Razor is known for their versatile age ranges, and it’s important to know that every child is different. If your child has a smaller build or new to dirt biking, then this bike might be perfect for them, however we still recommend checking out the electric motor bike beforehand just to make sure. After all, this is no small purchase, and should be thought through! The MX500 is ideal for any child that is enthusiastic about motocross bikes and wants to give riding them a go. The MX500 has a stable steel construction, can go up to 15mph and can go over various terrains. Its versatility is definitely one of its strongest points, and its pneumatic knobby tires will help carry your kids through all sorts of adventures. If you are not convinced about the MX500, then we can also recommend taking a look at the Razor SX500 McGrath Electric Motocross Bike. It comes in two colors: a bright, lively green and a reddish blue. It has a 36V rechargeable battery just like the MX500, and can carry up to 180 pounds of rider weight for a comfortable ride. The Razor SX500 McGrath Electric Motocross Bike can go up to 15mph, features a high-torque, large pneumatic knobby tires, a retractable kickstand and dual suspension. The Razor MX350 dirt rocket electric bike is also quite popular for younger kids, with the Razor MX650 dirt rocket bike being more popular with advanced teens. You can also opt for the more subtle Razor E100 electric scooter, the Razor E200 electric scooter and the Razor E300s electric scooter.